For many B2B marketers, IVR (interactive voice response) is now an integral piece of their demand generation campaigns. How are they using inbound and outbound IVR to generate and qualify phone leads? Would IVR help your lead gen efforts? Find out in this white paper. Is generating high-quality phone leads important to your marketing efforts? 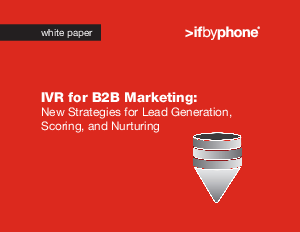 Learn how to better generate, qualify, and nurture inbound sales calls using IVR.